YAY!!! for warmer weather! Now that spring has sprung and we’ve started shedding our layers of sweaters, jackets, scarves, and gloves, I’ve been on the lookout for fun outside activities for my creative preschooler. While my 3-year-old enjoys painting, all those name brand paints can be a little pricey. So, I scoured the internet for homemade paints that are as easy on the wallet as they are to make. There are several homemade paints that can be made using different ingredients easily found around the house, such as this one using flour. Non-toxic, low-cost, and easy to make??? Can it possibly get better than that?? YES. IT. CAN! While your preschooler is having fun painting away, creating colorful artwork all over your sidewalk, she is also busy honing in on those fine motor skills using the paintbrush. 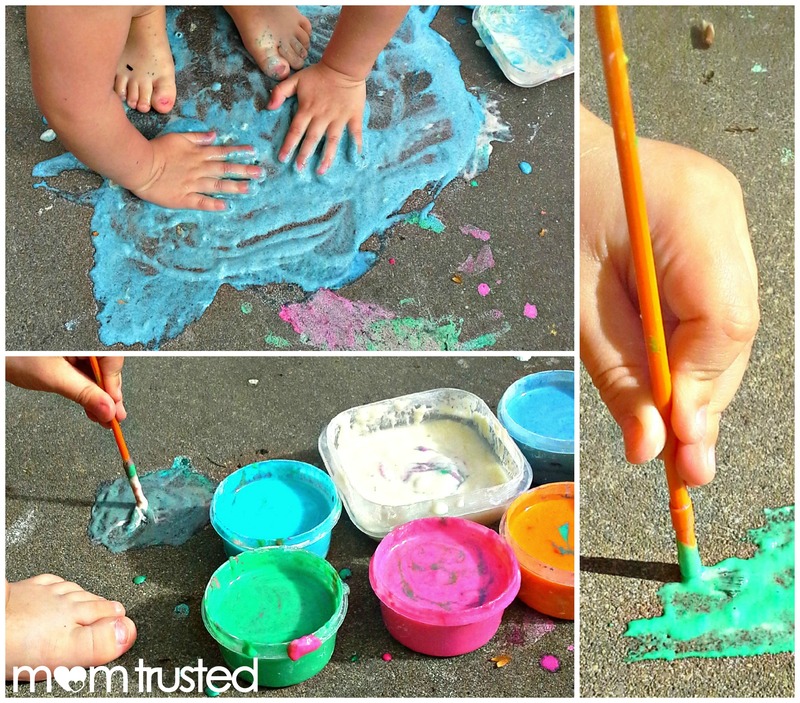 This is an easy project that can be extended to further help your preschooler focus on handwriting skills, such as giving them a index card with a word and having him/her “paint” the word on the sidewalk. And when your budding Picaso is done, your sidewalk will be decorated with a chalk-like work of art that will last until the next rain or until you decide to spray it off with the water hose. 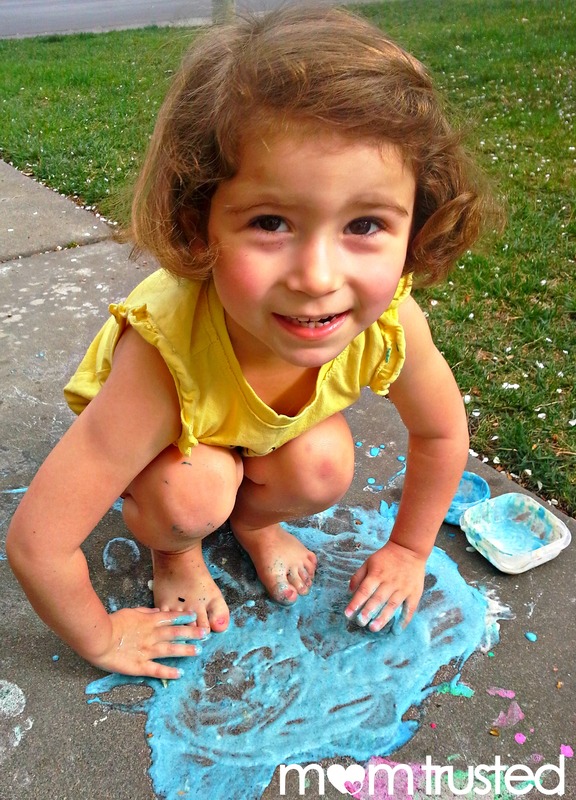 Here’s how we made our simple flour sidewalk paint. Step 1: In several small containers, have your preschooler(s) pour a little flour in them. TIP: It’s best to NOT fill up the container with flour because you need at least double the amount of flour with water so that it’s not clumpy. Plus, if it’s full to the brim, it’s much harder to mix and stir the food coloring. 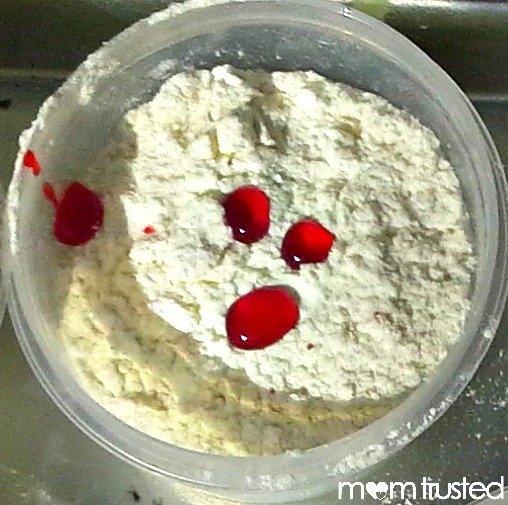 Step 2: Using a variety of food coloring, add 2-3 drops to the flour. TIP: I used a mixture of gel and liquid and found that less of the gel food coloring is needed compared to the liquid for a vibrant color paint. 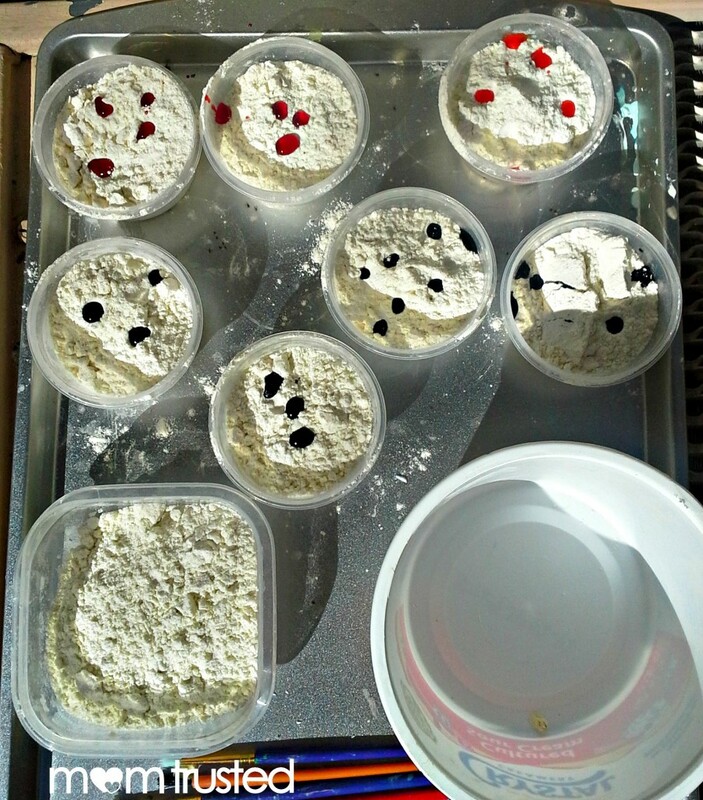 Step 3: Have your preschooler(s) slowly add water to the flour and food coloring. Very carefully, stir the mixture, adding more water as needed to make it less clumpy. TIP: As mentioned earlier, the ratio of water to flour is roughly about 2:1. Again, I didn’t measure since I had an impatient preschooler on my hands who really wanted to paint. TIP: I filled one container with flour but didn’t add any food coloring so my preschooler had a “white” sidewalk paint along with all the colored ones. 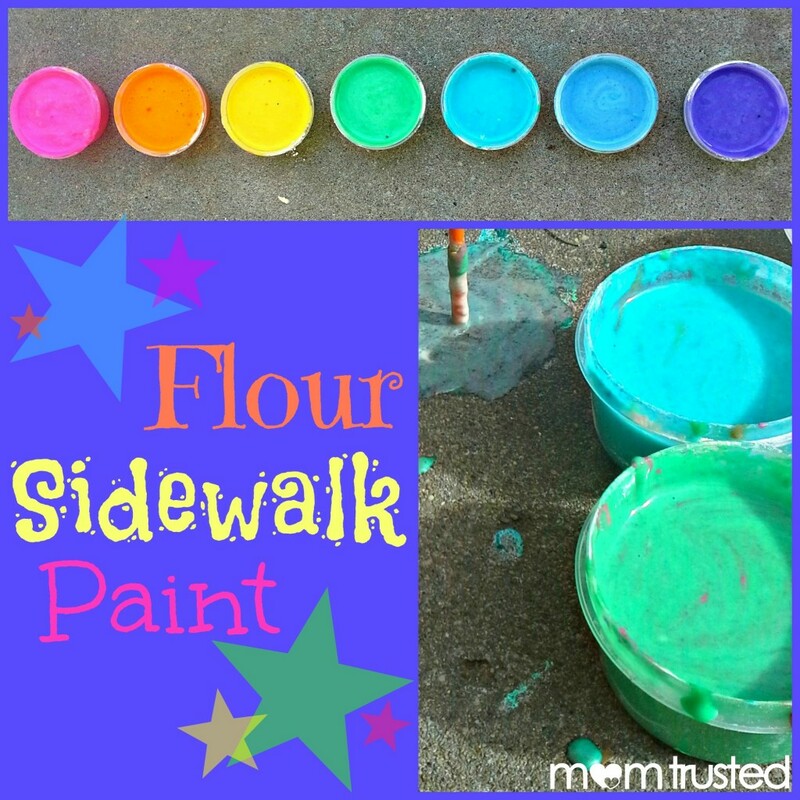 Step 4: Now the flour sidewalk paint is ready for your preschooler(s) to use to create some beautiful paintings that are simple to clean off with a spray of the water hose. Don’t forget to join in on the fun and make your own creations, too! 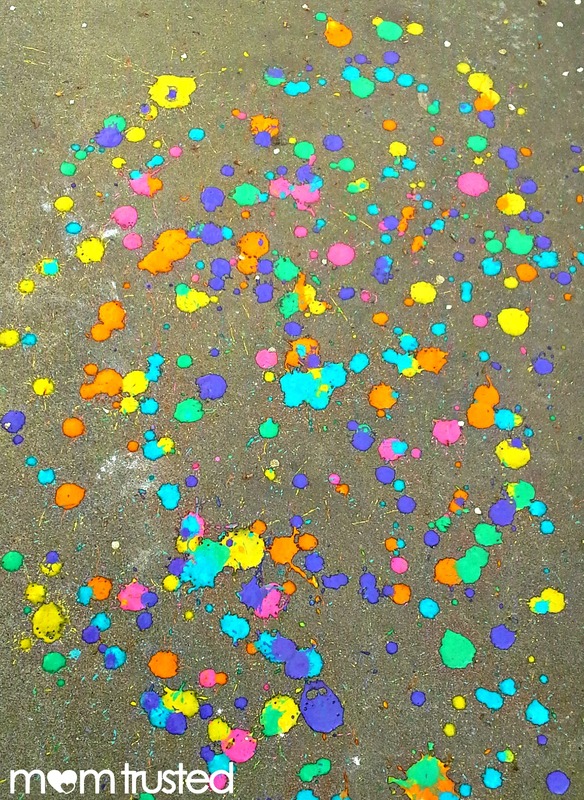 When it dries, it’ll look like you and your preschooler had a great time with a box of chalk. Enjoy! TIP: As your little artist is painting away, you may need to periodically add more water to the mixture to keep it clump free. TIP: Depending on the color of the food coloring, some of the flour paint may temporarily turn your child’s hand a fun color should they opt to be more hands-on and not use paintbrushes, as my little one often does. This is especially true for purple. Of course, the nighttime bath takes care of this. My kids had a blast with these. However I am having a hard time getting it off the sidewalk! Any suggestions?